I barely even made much cash, but it was one heck of a coincidental mix of a week. There’s more to mention that I care to for now, but I’m certain I will remember long enough to let this not be too personal for now. 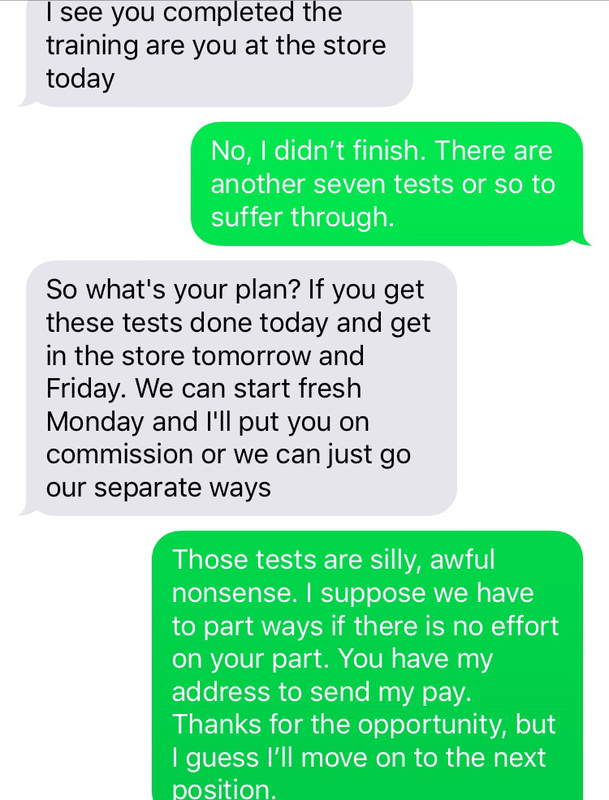 I just wanted to post the screenshot of the last text exchange. The manager wouldn’t release me from a silly portion of the job which was sucking my energy dry. I could have finished the exams, but I did not want to. Those exams were more drain than there worth and I had to say NO MORE!!! I’d rather be poor that kneel to silliness. Thing is, you have got to say no to nonsense, you do have an option. Now, I have moved on to better avenues and I’ve walked the rougher path, learned from the experience. I saw the dejavue as it began to occur and swapped directions, listening to my gut along the way. It felt proper and it still does. Regret not, as I listen to my gut. One more note I suppose. Went on down to the tech school. Both fond and dreadful memories for me at that institution fill my past. Today, I only saw the negative aspect as the new head of classroom gave me a hard time. She booted me from her classroom that she invited me to use… all because I refused to say exactly what I wanted to draw (on AutoCAD). Yet, on the walk to the classroom, before my attitude had a chance to sour, I happened across a beauty from my past. A friendly hug and a chat; haven’t seen her in two years. She commented on how I’ve “shrunk”. And I on her looking great, herself. About to turn and walk and asked if she’s dating anyone as I imagine she is. (I assumed correctly), but told her I would have asked her to dinner. All this is a shift of my past behavior. I would have been overly nervous, wouldn’t initiate contact with a hug, and may have even passed on without speaking. Though now I’m free. I spoke easily, though a hair nervous still. Had plenty to say and wished her well. It’s not like I haven’t been wanting to see her. That was nice. …the pedicab interview went smoothly as anticipated. A few hoops to jump through to begin, yet nothing super silly like the assembly gig. It’s all city paperwork for licensing. About $60 and a few stops at different city buildings and I could be ready in a day (if I had $60 hahaha)! And then it’s straight cash each night. No tax reporting by the bike company. So that’s awesome! This is tax free work! Since they don’t report individual drivers. 3:38pm, at Forsyth, lying in the van. About to go lay in the sun where I did yesterday. Hang on the monkey bars, before I cruise back to home. Traffic is wretched now. I’ll wait that out, but my stomach begins to growl. Ughh I cannot, or barely, afford to eat.